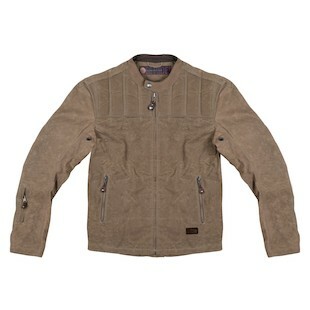 Roland Sands Enzo and Vandal Jackets Released! New from Roland Sands Design, today's dual release showcases two jackets with similar design. The contrast is in the materials used, one constructed from oiled, top-grain cowhide; the other styled with waxed cotton. 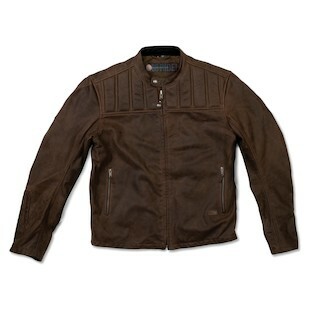 The Roland Sands Enzo Jacket is the top dog in this event, made from 1.2mm hand-treated leather. Sewn together with cafe-racer DNA, the Enzo has a performance riding fit and a vintage feel. Armor-ready in the shoulder, elbow, and back, the RSD Enzo is best suited for clubman bars, bump seats, and pea-shooter exhausts. Whether you are crouched over your headlamp evoking the need for speed, or simply rebuilding your shocks, again, the Enzo jacket has your eccentric fashion written all over it. RSD will be producing this beauty in Mahogany and Coal colors. Baby brother to the Enzo, the Roland Sands Vandal Jacket has a near identical facade, though this one is made out of waxed cotton. While not waterproof, waxed cotton has a unique ability in encouraging water to bead and roll off its surface. In a light rain, you will likely be able to stay dry for a short while. The same performance fit and aggressive styling applies here along with pre-configured for armor inserts. Perhaps a more casual solution, the Vandal may be best suited as your bar-hopping buddy or your weekend wingman. This rustic companion comes in Black or a lighter tan color called Ranger. Known for their exquisite leather and pristine attention to detail, Roland Sands Design continues to impress. Check out the whole collection at RevZilla.com.